Teves Mk60 ABS install - Page 2 - Miata Turbo Forum - Boost cars, acquire cats. I can confirm that the DSC version of the RX-8 ABS also requires the stock ECU to work as an ABS. I haven't seen any non-DSC RX-8s (but there definitely are non-DSC NCs, which still do require CAN). 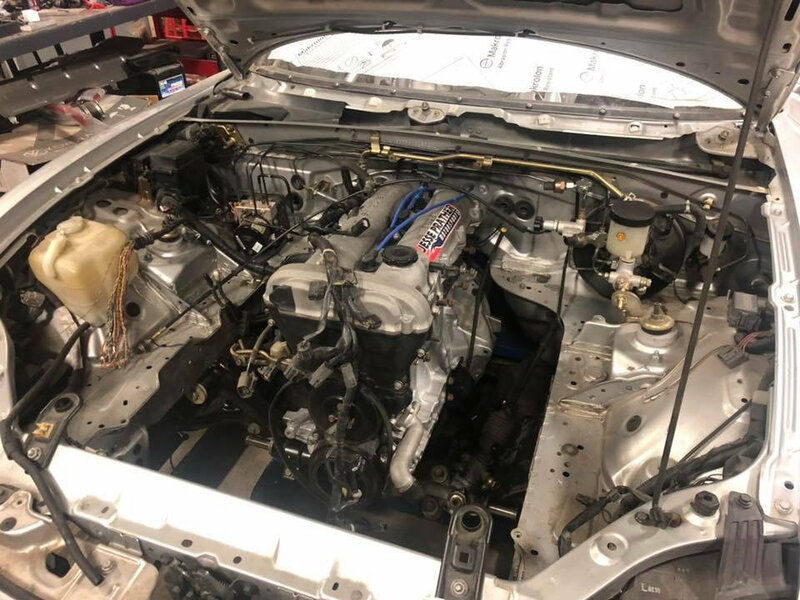 I have no personal experience and am just relaying what I've read and been told, but I also know of a V8 swapped RX8 (on a private forum) that just got the non-DSC RX8 module working on his car with no CAN communication. He started with the DSC version that came in his car and couldn't get it to work. Switched to the 04 non-DSC unit and almost instantly reported that the problem was solved and ABS was functioning. 0x212 is just one packet from the ABS, you need to actually send multiple other packets that mimic the stock ECU, some of them with continuous checksums. Which wheel speed sensors did you use? Compatible with the miata OEM abs rings and a direct bolt on or need some adapters? Did you just have the non-abs front spindles so you used those? Or they are necessary / ABS ones won't work? Also, who's reprogramming your MK60 to the motorsports firmware? From what I've been reading on the m3 forum, the regular E46 MK60 is programmed for the stock BMW hydraulic pressures, tire diameters, etc. and IIRC also goes in some kind of safety mode (lower thresholds) when CAN data from the ECU is missing. Some people there use rpi emulators to feed the MK60 with data emulating the E46 ECU and other CAN bus modules to make it somewhat happy for standalone installs. All that is solved with the motorsports firmware (which also gets rid of the DSC stuff, you need the 813.3 or the 817.3 MK60 hardware for reflashes to work) but AFAIK only very few people have that and charge crazy amount of money to do a reflash (because they can since the software never leaked for public use). These same people have flashes prepped not just for BMW for other applications like 997 Porsches (who dump their Bosch units for MK60), etc. Last edited by j_man; 02-11-2019 at 09:03 PM. We've got numerous parts cars laying around. The ABS front spindle will not work. It places the sensor basically in contact with the ring. The Non-ABS spindle have to be machined to work. We have a few contacts on the programming side and we have the 813.3 with the standard program and 817.3 with the ZHP program for testing. We are working on putting together a kit for the Miata. Probably going to be really track specific though. Don't know many who would want it on a street car. I have driven this system in other racecars. Very good and very abrupt when it intervenes. It gets in and out of operation very quickly. It's certainly not your Grampa's ABS on his 98 El Dorado. youll also need the motorsports reflash to get the light to turn off. Which of the rings were you testing with and was the contact minor or? The ones you drove - was that with the motorsports flash? Personal impression on how was it while hard trail braking in corners /abs engaged while cornering - better feel than the NB one channel rear? Last edited by j_man; 02-12-2019 at 02:05 PM. I have run into that before (an ABS ring that was barely in contact with the sensor). At the time I didn't have much to lose so I just spun the hub/ring around and used a hand file on the ring to turn it down to a smaller OD. Worked totally fine. We are using the inboard rings from a couple of 2000 Miatas that had factory ABS. No, they were the unflashable 818.3 units. I have never driven the Miata 3 channel ABS so I have no knowledge of how it feels. They were on C5 Corvettes, with which I have quite a bit of experience, and the standard Mk60 setup was way better than the stock C5 or 6 ABS. You could tell when it engaged and when it "got out" of intervention. One of them I drove was one of Louis Gigliotti's C5's with it in misty damp conditions on slicks. I couldn't go or turn but I could sure as hell stop. The other was a Vorshlag car on the street so limited in what I could do. I just ordered an 813.3 off ebay (off an M3 with 40k miles on it) with the lateral g, pressure sensors and connectors included. Now, where is the flashing sowtware? Last edited by j_man; 02-13-2019 at 04:30 PM. I have a spare complete MK60 out of an e46 m3 if anyone wants one. I can also provide a point of contact for a Bosch engineer that can re-flash the unit. Last edited by ITOzann; 02-13-2019 at 03:32 PM. You should specify whether it is a 813.3 or a 818.3 unit - because that's what's most important for those buying it for racing. Bosch engineer reflashing Ate units - that's interesting. Is he willing to give away the software since it belongs to the competition? We've installed a lot of these in a variety of cars, almost all of them reflashed with the motorsports software. Any insight on what specific parameters/numbers one needs to prepare for the person who'll be entering the data and generating the motorsports flash for the specific car? 813.3 is the unit I got. You can't reflash the 818.3 unit. I sort of figured that information would be explicit, my bad. Got a set of E46 sensors and saw what you meant. They probably could be hacked/trimmed plus using a thinner bolt to get them to line up, but using non-abs spindle where one drills the proper holes is the nicer solution. Are you making new brackets or just hacked the OEM ones? Seems the bracket should be much thinner where the sensor mounts so, it gets close enough to the trigger wheel. Also, does anyone know if BMW/Ate have published any specs on what the gap between these sensors and the trigger wheel should be? Last edited by j_man; 02-28-2019 at 04:32 PM.